Added by Indo American News on May 2, 2013. HOUSTON: “We hope that one day the India Studies program could grow into a magnificent place like this,” quipped Dr. John Roberts, Dean of the College of Liberal Arts and Social Sciences at the University of Houston, as he motioned around him at the opulent lobby and living room “to highlight its goals.” Standing on the marble steps of the foyer, he had just thanked the owner of the large house in the Memorial area for their generous gift of $100,000 to help the still nascent Foundation of India Studies grow further. The homeowners, Dr. Arun and Vinni Verma had not sought out compliments for their donation and in the self-effacing manner which they prefer, made every effort to play the event down. They are a deeply religious couple whose convictions are readily visible in their home from the portraits of Radha and Krishna which are adoringly displayed throughout their spacious home, down to a jhula (swing) settee nestling a painting of the baby Krishna in the living room. A two foot tall anodized brass statue of Krishna playing the flute welcomes you in the foyer. For the past three years, the Vermas have become widely recognized for the Ram Leela program held in the late Fall just before the Diwali festival. Last year, they took the entire celebration one step further by adding a Dusserah function at the Skeeters Baseball Stadium in Sugar Land attended by several thousand people, where eight-foot tall effigies of Ravana, brother Kumbhkaran and son Meghnath were set ablaze, followed by a huge fireworks show. This first ever event is still the talk of the town. So, it was not unexpected that Arun opened up the dinner and dialogue event organized by the FIS with a reminder that this concluded the nine days of Ramnvami (celebrating the birth of the Lord Ram) and that the day, Thursday, April 25, was also an auspicious day since it marked the birth anniversary of Hanuman. To honor it, the chief guest, Dr. Renu Khator, President and Chancellor of the University of Houston, prompted Verma to recite the Hanuman Chalisa, a devotional hymn written by the sage Tulsidas. Verma asked her to step besides him to do so and they both recited the forty verses in rapidfire, as other Hindus from the about 60 guests joined in, while those from the mainstream listened and watched with rapt attention. The Indian Consul General Harish Parvathaneni spoke eloquently in support of the FIS program, noting that its curriculum (which is still being put together) would have to perforce be very broad as India itself was so vast, diverse and ancient that it offered educators more than just a few angles to study. He reported that he had been discussing with the Indian Ministry of External Affairs to establish an India Studies Chair and hoped to soon be able to bring in two visiting professors from India. His remarks were echoed by Khator, who also noted that “the time was right for Indian studies to take off’ in the fourth largest city in the US. We have such a huge Indian population base with so many temples, restaurants and businesses that can support the FIS program,” she added as she enthusiastically welcomed Verma’s donation. Dr. Roberts related how, while his community has been a part of this country for many generations, he had grown up in the segregated South without any exposure to courses that dealt with his African-American ancestry or culture. He pointed out that the FIS would provide an opportunity for future generations of Indian Americans to stay connected to their heritage. Roberts applauded the Vermas for the gift which will be directed to funding scholarships, visiting professors, lectures and programs dealing with Hinduism and spiritualism from the Vedas. He noted that several months back Dr. Durga Das Agrawal and his wife similarly created a $100,000 endowment to fund India Studies postdoctoral research. Dr. Lois Zamora, of the Department of Comparative Cultural Studies at UH which includes the FIS, spoke about her plans for building an all encompassing curriculum. She also explained that a winter term study abroad program was being developed for those wishing to go to India and that she hoped some scholarship or support could be raised for about 15 people who make up the group. She then asked Craig Wilson, son of UH Regent Welcome W. Wilson Sr. and involved in the family’s real estate business but also volunteers at UH to talk about his recent trip to Jodhpur, Rajasthan. Wilson explained that he would like to raise funds to help the people there with a community center and link that with the Jack Valenti School of Communication, of which he is on the Board of Directors. 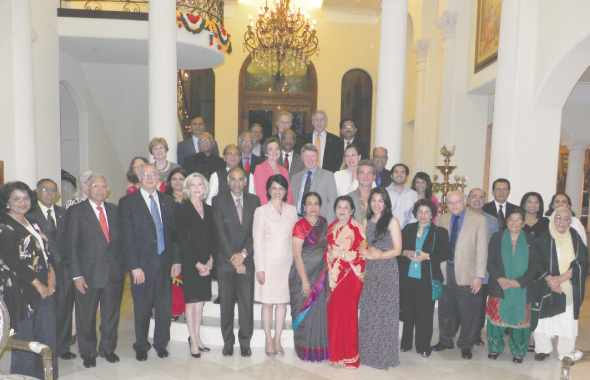 The evening concluded with a buffet style vegetarian dinner served in the fragrant rose garden behind the Verma’s house.